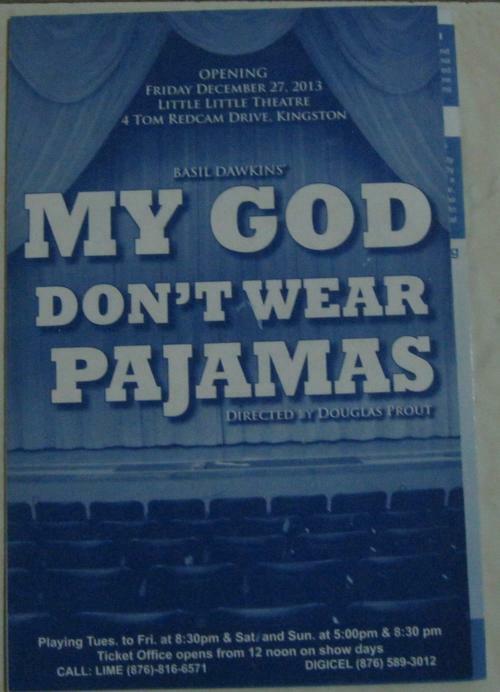 After my disappointment with The Golden Macca Fat my faith in Jamaican drama was restored by the Little Little Theatre’s production of Basil Dawkins My God Don’t Wear Pyjamas. I went with a friend that I’ve not seen since we were both 17 years old. By some super sleuth work she tracked me down – but that’s another story. Even though we arrived nearly an hour early (my friend had not booked and was keen to get tickets) there were people already seated in the one hundred and fifty- seater younger sibling to the Little Theatre. This was a good sign. From the very beginning when we stood for the national anthem (most productions in Jamaica, and Jamaican productions abroad, begins with the audience standing while the national anthem is played) there was sense that something special was about to take place. We were taken on a roller coaster journey of, betrayal, greed, misplaced loyalty, rejection, and finally reconciliation. The characters moved and amused us in equal quantities. There was definitely no chance of me falling asleep in this production. In fact I was stunned to find that two and a half hours had passed so quickly. I’d thoroughly recommend this production which runs at the Little Little Theatre till April 27th.